Being Korea’s foremost seasonal festival, Chuseok is often compared to American Thanksgiving, although its pedigree is far older, perhaps stretching back to a 2,000-year-old, Shilla-era weaving contest under King Euri. The archaic Korean “Hangawi” means great middle and Chuseok itself means mid-autumn in Chinese. Both refer to the autumn full moon, and Korea's fall clear skies are often a blessing on this day. A time to honor both the harvest and the ancestors, families travel to their hometowns for a feast on the 15th day of the eighth month of the lunar calendar, or eumryeok, sometime during September or early October. This year, the three-day holiday falls from Saturday, Sept 26, to Monday, Sept 28. Thanks to Park Geun-hye’s 2014 “Substitute Holiday Bill,” hardworking folk can also enjoy the next Tuesday off work, meaning only one day is lost to the weekend. 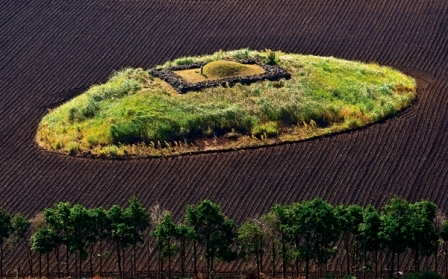 First things are first on Jeju, however, and this means cleaning the ancestors’ graves in a ceremony known as Beolcho, performed from the 1st day of the eighth lunar month up to the day before Chuseok. To be sure, this tradition is also found on the mainland, but Jeju people hold it in much higher esteem, even sometimes prioritizing it above Chuseok itself. Many point to Jeju’s strong gwendang (extended family network) culture to explain this. This is because it is not only a chance to pay respects to the departed, in the form of removing weeds from the grave, but also allows for bonding between males of the clan who might not gather often. Not on Jeju? Not an excuse. All males are expected to make the trip, no matter how inconvenient, and many fly down from Seoul to help out. Modern lifestyles (and conveniences) are such, however, that hired hands are available and pick-up trucks full of earthy, no-nonsense gardeners can be seen touring the countryside over this couple of weeks. The burial plots, grave mounds surrounded by a stone wall (and, perhaps, a dongjaseok child statue), are often in felicitous spots atop an oreum, local geomancy being of far more concern than ease of access for descendants. The thick basalt stone wall, intended to protect from the wind and grazing animals, is also a stern test for hamstrings and mower blades. Keep an eye on the graves near your home at this time of year. You will see the freshly cleared ones, looking like they have been cropped with giant hair clippers, and those that remain shaggy, with perhaps no tending descendants available. Once the work is complete, which can take hours to days, a Confucian ceremony is held at the grave. To ensure the ancestors are appropriately honored, bows are filially made and food is generously offered. At the Chuseok festival itself, Jeju’s traditions are most noticeable in the feast served up, and after Beolcho you will have earned it, assuming you are male; for females, the hard labor — hours of food preparation and hosting guests — begins now. On Chuseok morning, families perform a “charye,” a memorial service for their ancestors and then visit relatives’ houses one by one for delicacies including pork, buckwheat, barley and even shark. The neverending rounds of food, as well as magically refilled glasses of Hallasan soju, mean the abiding memory of a Jeju Chuseok is likely to a throbbing head and bursting gut. But rest assured you will be in very good company. 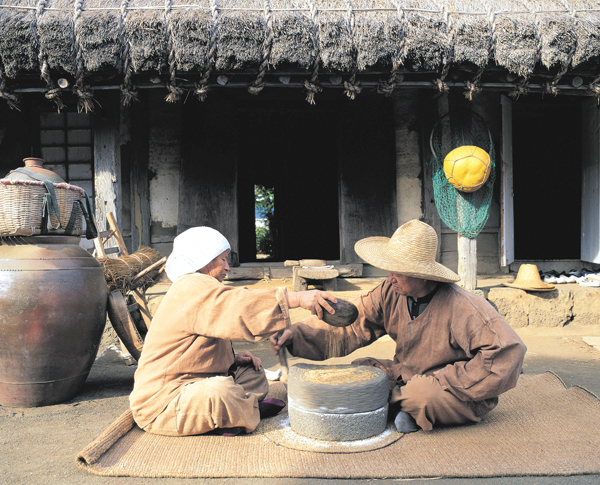 With rice traditionally scarce in Jeju, barley, buckwheat, and wheat are the main staples for the rice cake, or tteok. 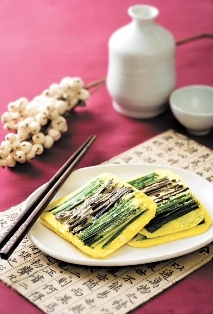 Bingtteok, for example, is a buckwheat pancake rolled with boiled radish and seasoning, and sangeotteok is a fermented rice cake similar to bread. Another local twist is found in the buckwheat, mung bean, or acorn jelly “muk” traditional in the east. 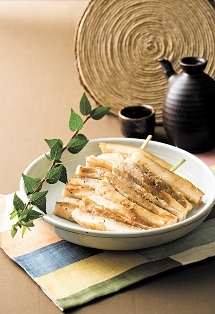 In the west, where soybean was sown, tofu muk is more common. A Chuseok meal would not be complete without plenty of skewered meats, “jeok,” and on Jeju pork is more common than on the mainland, although you might even find some mini shark kebabs. Now that you have tried it all, it is time for a rest — just make sure you’ve done the washing up!